Join us at the Official Party! We’re having a party! And if you’re attending Open Source Bridge, you’re invited! We’re holding an official conference party this year, sponsored by Gilt Groupe and Simple. We’ll have music, adult beverages, hearty snacks, StepMania (open source Dance Dance Revolution), a raffle with awesome prizes, and more! There’s something for introverts and extroverts alike, so please make plans to stop by! 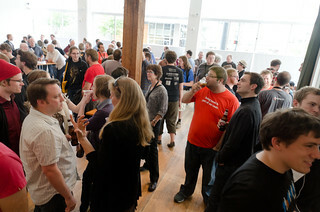 Note: The hacker lounge will close early on Thursday evening, at 8pm sharp. This entry was written by audrey, posted on June 19, 2012 at 3:46 pm, filed under announcement, conference. Bookmark the permalink. Follow any comments here with the RSS feed for this post. Both comments and trackbacks are currently closed.